Rather than take on the task of assessing every waterway in Iowa, EWG picked five counties – Allamakee, Hamilton, Linn, Plymouth and Union – chosen to reflect each of Iowa’s five major landscape regions (Figure 1). 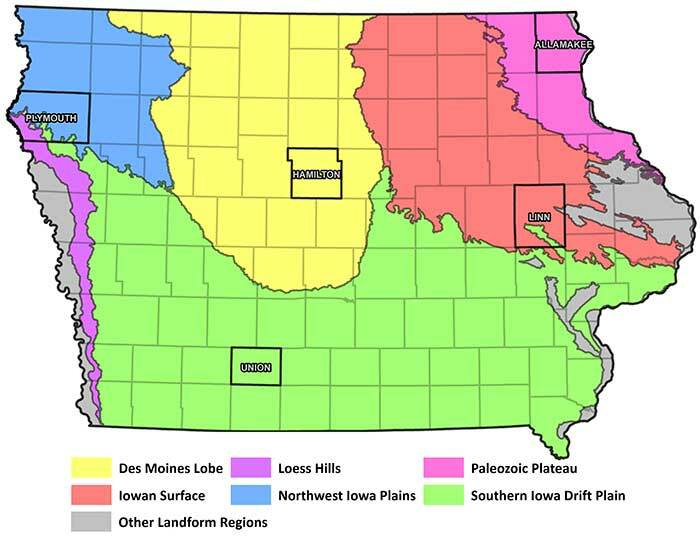 Figure 1: The five counties are in each of Iowa’s major landscape regions. We also selected these counties so as to reflect the wide county-to-county range in the percentage of land devoted to row crops (Table 1). For example, Hamilton County, in the center of the Des Moines Lobe landform, is almost entirely cultivated, while farming is far less prevalent in Allamakee County in northeast Iowa’s Paleozoic Plateau because of the region’s karst topography. EWG limited its assessment to named waterways in the US Geological Survey’s National Hydrography Dataset (NHD) in order to focus as much as possible on perennial waterways. Of the total of 1,742 stream miles across the five counties (Table 1), 81 percent are perennial, 15 percent are intermittent and 4 percent are ditches. For intermittent streams and ditches, we limited our assessment to those segments that have defined beds and banks.